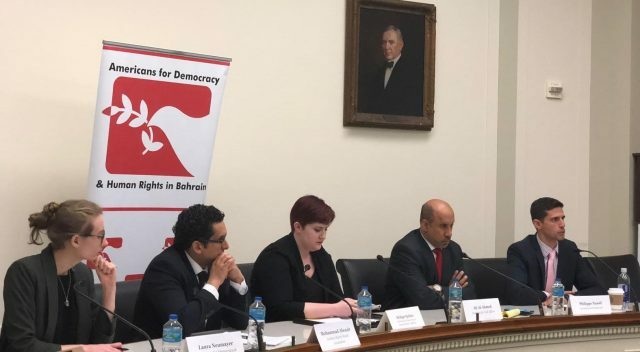 11 April 2019 – Yesterday, Americans for Democracy & Human Rights in Bahrain (ADHRB) hosted an event in Congress on the human rights situation in Yemen. 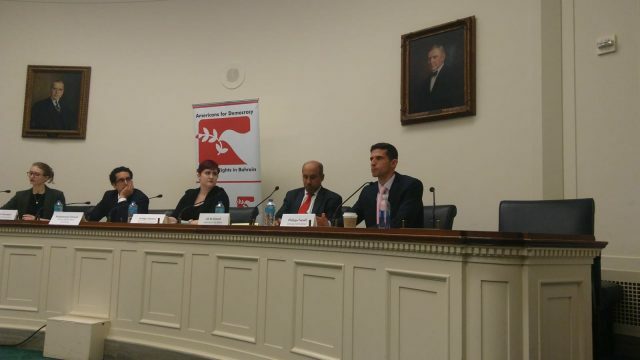 The event, moderated by Bridget Quitter of ADHRB, featured expert panelists including Mohammad Alwazir of the Arabian Rights Watch Association (ARWA), Ali Al-Ahmed of the Institute for Gulf Affairs, Laura Neumayer of ADHRB, and Philippe Nassif of Amnesty International. Quitter began the event with a short opening statement and introduction of the panelists and the topics of their remarks. She referenced the ongoing human rights abuses in Yemen, and the need for reform and action on these issues. From their, she yielded the floor to Mohammad Alwazir. Mohammad Alwazir focused on how the conflict in Yemen has progressed to its current state, emphasizing the myriad of geopolitical factors that have enabled the Arab Gulf states to create the worst humanitarian crisis in the world. 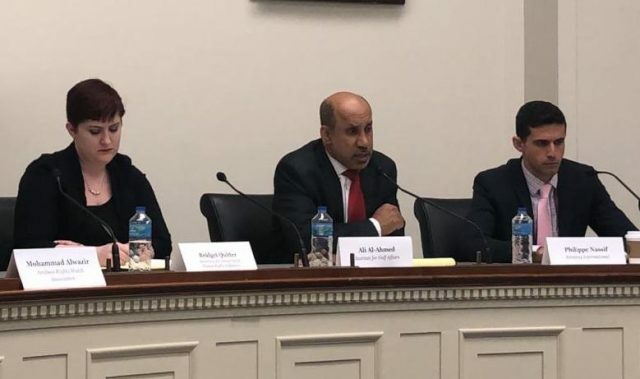 Alwazir noted that US Congressional legislation designed to halt US support for the war in Yemen is aimed at preventing Saudi Arabia’s human rights abuses not ending the US-Saudi relationship. Through its leverage over the Gulf states, the US can pressure Saudi Arabia to leave a conflict that has been described as a “gross miscalculation.” One legislative mechanism would utilize the War Powers Act to give Congress the power to halt the sale of weapons. Such a move would also fit within President Trump’s campaign promise to avoid foreign entanglements and could spur the Saudis to end the worst humanitarian crisis in the world. Alwazir then provided a brief overview of the history of the conflict. Fault lines first appeared when Yemenis began protesting the rule of long-time President Ali Abdullah Saleh, advocating for a more transparent, fair, and equitable government. Many Yemenis argued for fairer distribution of government services and jobs, and wanted to refocus the country on its fight against terror groups, including Al Qaeda. After nine months of protests, the Gulf Cooperation Council (GCC) supported the creation of a resolution that peacefully transferred power from Saleh to his Vice President, Abd Rabbu al-Mansour Hadi. This resolution–approved without popular support–gave Hadi two years to hold elections and draft a constitution. When his term expired, Hadi ran in a non-competitive single candidate election extending his term, reportedly receiving 100% of the vote. Hadi later fled Yemen for Saudi Arabia and the coalition claimed that he had demanded help from other Gulf states and the UN to restore his government. The government subsequently used his ‘plea’ as a casus belli to justify an intervention in Yemen. Since then, the human rights situation in Yemen has deteriorated, as fighting as proliferated and units of the Yemeni army, militias, Shia Houthi rebels, and terrorist groups like Al Qaeda square off against one another. Although the Coalition predicted an easy victory, they have since caught themselves in a wartorn quagmire. As the conflict has sapped coalition manpower, they have begun to rely on mercenaries, militia proxies, and troops from Senegal and Sudan. Desperation on both sides has resulted in massive human rights abuses. Currently, 300,000 civilians have been killed in Yemen, with one child dying every 10 minutes since the invasion began in 2015. To make matters worse, the Saudis and Emiratis have engaged in prolific airstrikes and shelling that has maimed even more innocents. And to top it off, coalition blockades of Yemen’s sea and air ports have adversely affected around 27,000 citizens due to delays in aid shipments, exacerbating the debilitating famine ongoing there, and preventing them from leaving the country to seek medical care. Ali Al-Ahmed launched into a discussion of the western and international media’s unwillingness to confront the Gulf States on the atrocities they are carrying out daily in Yemen. By failing to “call a spade a spade” — referring to rhetorical dodging such as the reference of Saudi airstrikes as explosions — media outlets have failed the international community and the Yemeni people. Saudi attempts to isolate and destroy Yemen’s ability to resist was referenced as a colonial effort by Saudi Arabia designed to secure Yemen’s resources and ensure its dependence on Saudi Arabia. To bolster his point on Saudi imperialism in the Gulf, Al-Ahmed cited the diplomatic embargo against Qatar, a ploy he said was designed to isolate the country and its massive petrol reserves. Al-Ahmed called on the international media to emphasize Saudi Arabia’s attempts to spread its influence as well as Saudi airstrikes that deliberately target civilians–a clear violation of international law. He argued that the Saudis are in possession of precision guided weapons and sophisticated radar equipment that allows them to precisely target objectives for airstrikes, indicating no excuse for the number of civilian casualties or the degree of destruction of infrastructure occurring. Al-Ahmed provided further context for neglect to the crisis in Yemen, citing that the World Health Organization had stopped delivering vaccines to Yemen following a large Saudi donation, underreporting from the UN regarding the civilian death toll in Yemen, and that few protests were occurring against western involvement in the worst humanitarian crisis in the world. The ongoing war in Yemen will likely continue unless there is significant international action to pressure all parties to come to a peace agreement. Laura Neumayer opened the discussion around accountability for systematic human rights violations perpetrated in Yemen, explaining that, while all sides involved in the conflict are perpetrating abuses with impunity, sovereign state actors engaging in coalition efforts are obligated to uphold international human rights and humanitarian standards in their operations. Neumayer explained the array of rights violations perpetrated by coalition members, ranging from reports of abysmal prison conditions and abuse from UAE-run prisons, indiscriminate airstrikes on civilians and critical infrastructure and the targeting of human rights defenders and journalists with a great lack of accountability. Concerns surrounding these violations and impunity have been raised by the Group of Eminent Experts (GEE) on Yemen, Human Rights Watch, Amnesty International, Doctors Without Borders, and others. This culture of impunity extends beyond coalition tactics in Yemen and has been demonstrated domestically. Since 2011, the Bahraini government has led an increasing crackdown on civil and political society space, particularly in the lead up to the November 2018 lower parliamentary elections. The elections were considered neither free nor fair given that political opposition groups were dissolved and the government continued to target human rights defenders, dissidents, and opposition figures. In Saudi Arabia, the government has imprisoned dozens of activists, including women’s rights activists, and murdered Washington Post columnist Jamal Khashoggi. As recently as last week, another wave of individuals with ties to women’s activists had been arrested. The UAE continues to foster abysmal prison conditions at home as well as in Yemen and handed a 10-year prison sentence to human rights defender Ahmed Mansoor for his activism in May 2018. Given the dearth of respect for human rights within the states comprising the Arab coalition, it is not surprising that the coalition feels it can act with impunity. Though the US administration has made calls for transparent investigations from the coalition’s Joint Investigations Assessment Team (JIAT), there are concerns surrounding the administration’s reliance on an oversight mechanism that has been deemed by some independent human rights monitors as lacking independence. The US State Department 2018 Human Rights Report on Yemen reiterates some of these concerns. To this end, Neumayer explained that with such questionable oversight mechanisms in place and apparent concerns surrounding transparency and prosecution, these systematic violations repeatedly committed by coalition forces will only persist. However, US pressure still has a key role to play in holding coalition members accountable for ongoing rights violations. Philippe Nassif spoke last and began his remarks by citing statistics collected by Amnesty International that document widespread war crimes ongoing in Yemen. According to Amnesty, 11 million people in Yemen are currently in some stage of famine, a number approximately equal to the population of Ohio. Nassif stated that Saudi Arabia has conducted 19,216 air raids over Yemen, amounting to 14 strikes per day, or about one every 106 minutes. These strikes have killed 17,000 civilians, 25 percent of whom have been women or children. Furthermore, 38 percent of these airstrikes have been against purely civilian targets, including bridges, roads, power plants and sewage plants. Furthermore, low end estimates say that 80,000 people have been killed as a result of fighting in Yemen, including many women and children. These statistics emphasize how essential it is that western powers take immediate action to cut off the coalition’s access to weapons, and force them to the negotiating table. In particular, Nassif emphasized the participation of the UAE in the Saudi-UAE led coalition, calling attention to their significant role in the coalition, and highlighted how the Saudis and Emiratis have contributed to the crisis. Despite the enormity of these statistics and the toll of the bombing on Yemenis’ lives, the Trump administration has denied that the Saudis and Emiratis deliberately target civilian infrastructure. However, using satellites and tracking equipment, Amnesty has been able to disprove this claim, and secure clear evidence that the coalition is actively targeting civilians–a war crime. Despite this, he added, Saudi Arabia and the UAE show no signs of stopping their attacks. Nassif then turned his focus towards what the United States can do to apply pressure to the Saudis and Emiratis directly. He applauded the recent war powers bill in Congress, but also stated that an additional bill entitled the Saudi Arabia Accountability in Yemen Act (S.398) could soon be voted on in the Senate. Nassif argued that this bill represents the most comprehensive way yet to fully address the US-Saudi relationship. The bill, introduced by Senators Menendez and Young, would sanction the Saudi government in an attempt to further pressure it to move towards the negotiating table and reach a political settlement. Nassif concluded his remarks by arguing that we must maintain momentum and activism on Yemen and Saudi Arabia and that Congressional efforts are having an effect on Saudi Arabia. For example, soon after Congress passed a bill condemning the Saudi and Emirati conduct in Yemen, the sides reached a temporary agreement in Stockholm, where they are negotiating for a political settlement. Nassif also stated that the recent arrests of Saudi activists by the government demonstrated the government is feeling the pressure. Quitter opened the floor to questions. 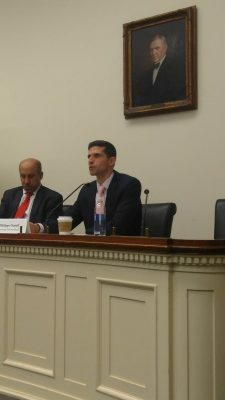 The first question, directed at Nassif, inquired how a crackdown by the Saudi government could be evidence of the effectiveness of legislation focused on Yemen. 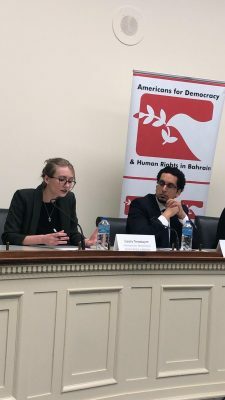 The second question, posed by Rosie Berman of the Tom Lantos Human Rights Commission, focused on Bahraini human rights defender Nabeel Rajab and his imprisonment as a result of his criticism of the war in Yemen. Finally, Medea Benjamin of CodePink, asked whether the crackdown cited by Nassif was more evidence of Saudi Arabia’s dismissal of the international community, rather than its fear. The panelists stated that the crackdown launched several hours after the passing of the War Powers Act was on a scale not seen since the death of Jamal Khashoggi. The crackdown included the arrest of activists, although the government released several others who had been detained due to their activism surrounding the now-lifted ban on women driving. 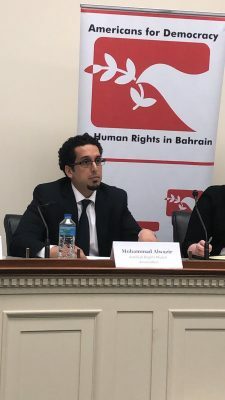 Nassif argued that the fact that Congress stood up to the Saudi government was unexpected and that this Congressional rebuke and subsequent Saudi crackdown was evidence of the kingdom’s paranoia around dissent. Should the US government continue to assert itself, the Saudi government could become increasingly agitated. Al-Ahmed countered by saying that secretly, the Trump administration has assured the Saudis that regardless of what steps Congress takes, the US would continue to supply the kingdom with weapons and continue to provide military advisors. 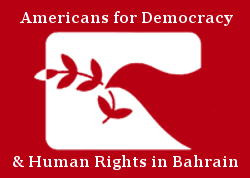 In response to Berman’s Bahrain question, Neumayer added that Rajab’s imprisonment confirmed the Bahraini government is equally afraid of dissent, even if it is against another state, because Rajab had criticized Saudi Arabia, but was still imprisoned. She noted that Ebrahim Sharif, a Bahraini political activist, was also recently jailed after he criticized Sudanese President Omar al-Bashir, and former Bahraini MPs had been arrested for calls to boycott the November 2018 election. The final question was asked by staff oft the House Foreign Affairs Committee, questioning Saudi goals in the war, possible ways forward, and how to find a peaceful resolution to the war in Yemen. Mohammad Alwazir responded that, officially, the Saudis are involved in Yemen in order to bring President Hadi back to power, and are acting in response to his supposed plea for assistance–despite lacking any popular support. Alwazir also argued that peace was entirely dependent on how much pressure Western governments–most notably the US and UK–were willing to put on Saudi Arabia and members of the coalition.